Figure 1: Gold Ecclesiastic Merit Cross, Image from author’s archive. 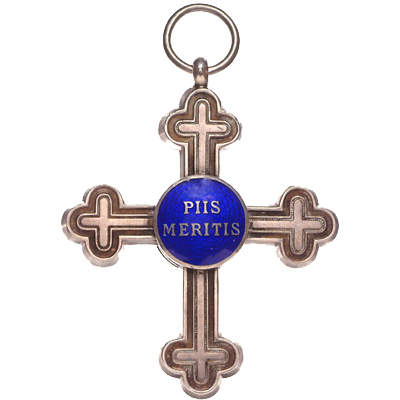 The Ecclesiastic Merit Cross was issued from 1801 to the end of the empire in 1918. They were issued to recognize distinguished wartime service by Military Field Chaplains which involved personal sacrifice and or bravery while ministering to the troops under fire or at the front. During the period in which these crosses were issued they went through a number of changes. This blog will discuss the first issue of the gold cross from 1801 to 1859 and the first issue of the silver cross from 1801 to 1880. Reason Issued: To recognize distinguished wartime service by Military Field Chaplains which involved personal sacrifice and or bravery while ministering to the troops under fire or at the front. This cross was authorized to replace previously awarded Military Honor Medals that although not exactly appropriate had been issued to military ecclesiastics for meritorious services. Design: A Latin cross with trefoils at the ends and a circular center medallion with a soldered flat-edged circular suspension eye on the top arm. 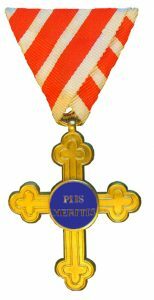 Figure 2: Silver Ecclesiastic Merit Cross, obverse, Image from author’s archive. Obverse: The arms of the cross have a deep grove (2 mm) inside the edge which follows the contour of the cross. A second finer and shallower line lies within the first. In the center of the cross is a 17-20 mm round, applied medallion with an edge in the same material as the cross. The medallion is enameled blue with an inscription in the same metal as the cross. The inscription reads PIIS / MERITIS (Pius Merit) in two lines. Figure 3: Silver Ecclesiastic Merit Cross, reverse, Image from author’s archive. Reverse: The reverse of the cross including the center medallion is the same as the obverse. Figure 5: Gold Ecclesiastic Merit Cross, miniature, Image from author’s archive.